On Earth Day, I attended the March for Science in Washington DC. It was a rainy day, and many signs parlayed the rain into witty observations rallying around science. Considering the rain, I was very impressed with the turnout. The speakers were good, Jon Batiste played, and the whole event had a very chill vibe. Also it was literally chilly but those two things were actually not related. My favorite part of any gathering like this is definitely the signs. There are so many imaginative messages! Signs were clever with funny word play, included jokes involving elements from the periodic table, named famous (and not famous enough) scientists, displayed math jokes and equations (math jokes are a thing), and quipped about how science is literally everything. Here are a couple I photographed while there. She was quoting the bacteria. I also loved that the event was very pleasant and uplifting in general. We arrived, mingled, listened to music and some of the speakers, and marched. Then stopped. Then marched again. Talked to everyone around us about how we weren’t marching ha ha, then marched, stopped, marched, stopped, etc. 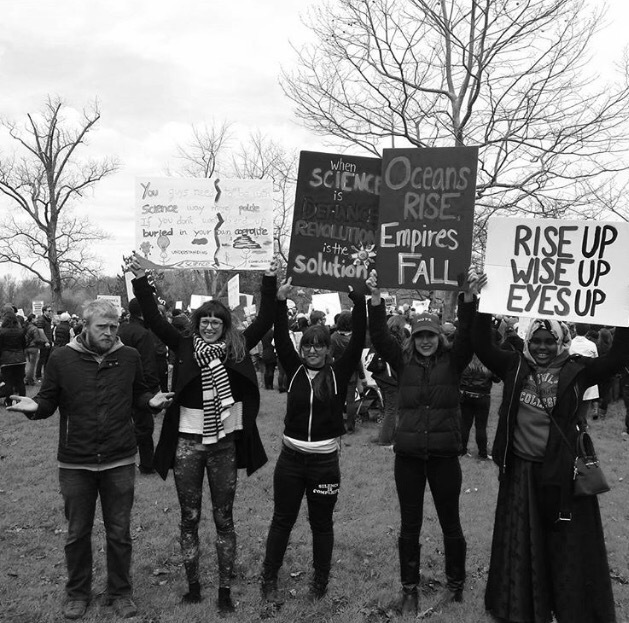 Once we finally got underway and marched without stopping, we enjoyed moving through Our Nation’s Capital and participating in chants (What do we want? Science! When do we want it? After peer review! ), and even ended up splashing through a few puddles on Constitution Avenue on our way. The good thing about science is that it’s true whether or not you believe it. On the other side of my sign was this quote. Speaking of Bill Nye, that reminds of a sign at the march that read, Without science, Bill Nye is just The Guy. Do you see what I mean? Clever. My fellow marchers, K.L. Kranes (author of young adult novel The Travelers) and her husband made signs too. Hers read, “Without science, it’s just fiction.” And his read, “Alternative facts are √-1” (which means, in case you’re not into math, the square root of negative one is an imaginary number. It’s not real. And so, alternative facts are not real. Ha ha!). It was fun to be there celebrating science, asking people to explain their more “sciency” signs to us, participating and sharing a common cause with our fellow citizens as we got our feet wet and avoided poking and being poked by umbrellas in the rain, exercising our first amendment rights to free speech and to peaceably assemble. Speaking of Neil deGrasse Tyson, he hosts a podcast called Star Talk Radio. Listening to this show will make you feel smart (or smarter, if you already feel smart). They recently posted Part I of the segment “Let’s Make America Smart Again.” While I don’t consider myself “sciency,” I love Neil deGrasse Tyson’s manner and his ability to discuss high-level things at a low level where even people on the street (like me) can understand and relate to the discussion. This is an incredible skill. Plus you’ll hear the song “The Sound of Science” by the Beastie Boys in every episode. Anyway, this podcast episode featuring Baratunde Thurston, Cory Booker, Eugene Mirman, Jo Handelsman, John Holdren, and Ophira Eisenberg contains great information with well-spoken and educated guests, funny comedians keeping it light, ideas on what you can do, and the why of the way things are going. I highly recommend giving it a listen. Go out there and get ’em! Science!